James William Halvangis (1920-1973), my maternal grandfather, was the only one of my four grandparents who died before I was born. I never got to “meet” him. Until now. One of the greatest joys of this hobby, genealogy, is getting to know some of the profoundly important people in your family tree through photographs. I would like to share with your some of the photos I have come to know my grandfather by. 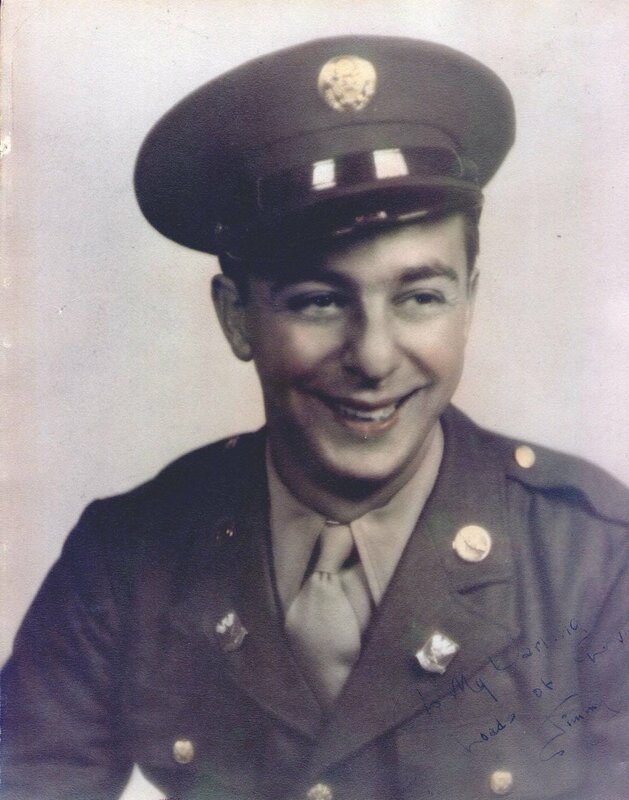 I love this photo from my grandfather’s Army days. His smile is caring and sweet. His eyes glow. The inscription in the bottom right corner, written to my grandmother, Claire Pawlowski Halvangis (1916-1980), reads: “To My Darling. Loads of Love. Jimmy”. In this progressional studio portrait, taken a couple of decades later, my grandfather shows the same caring smile. The two photos above are the ones that I have come most to associate with my grandfather. I have collected and archived hundreds of other photos in the last couple of years. All of them have been new to me. Each one tells a different story and helps me learn more about my grandfather. Here are just a few of them. 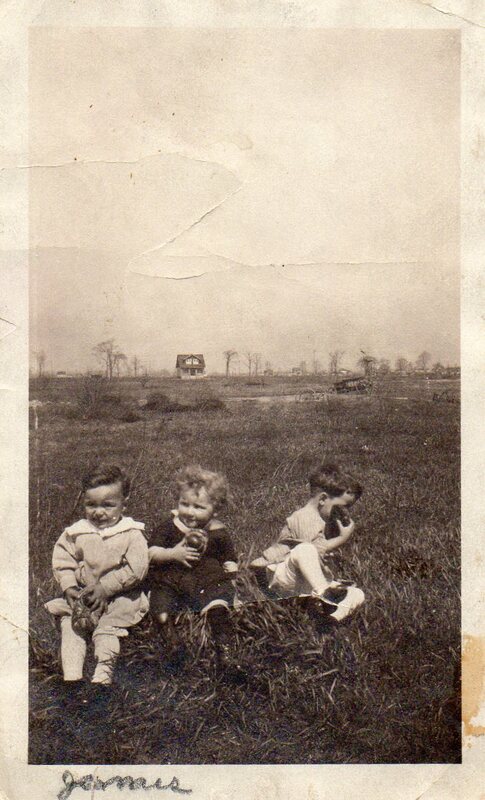 Though I am not positive, I believe one of these young children is my grandfather as a toddler. Here is one of my grandfather, probably as a teenager. He is standing with his sister, Pauline Halvangis Majka (1922-1999). Both both were born in the U.S. (Detroit) but their parents were immigrants from Samos, Greece. James and Pauline are dressed here in some traditional Greek clothing. 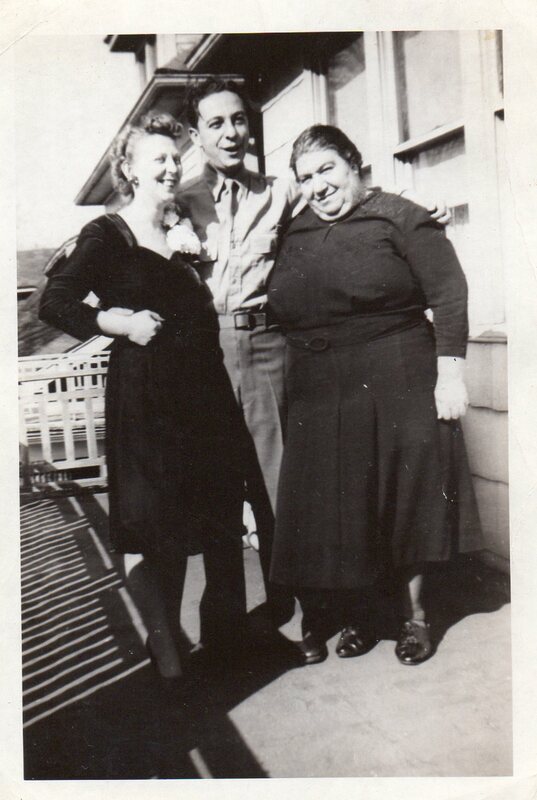 Here is my grandfather flanked by his mother, Maria Chardoulias Halvangis (1894-1951), on the right, and his wife, Claire, on the left. My guess is that this was taken while he was on leave from the Army. 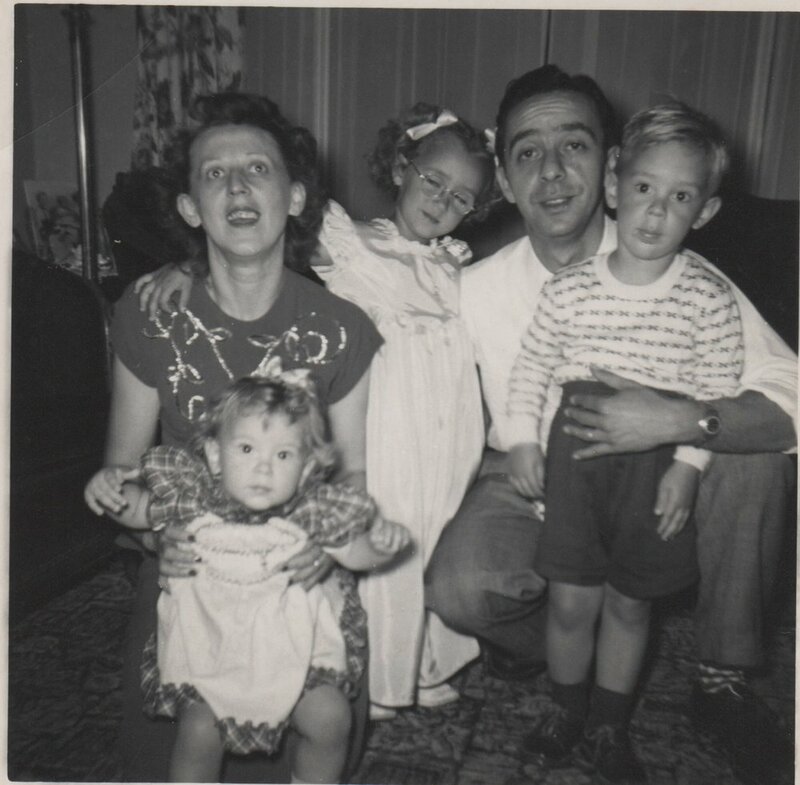 There has been some family discussion as to whether or not my grandmother is pregnant in this photo. The timing seems right, but it is hard to tell if that is a baby bump or a shadow. What do you think? Another photo probably taken while on leave. From left to right are: Adam Pawlowski (1879-1959) (James’s father-in-law), James, his wife Claire, and his mother Maria. And here he is, probably around the same time, looking a little more relaxed. After being discharged it looks like James traded in Army gear for a suit. This wasn’t his daily wear (he drove truck for a living), so this must have been a special occasion. Here he is looking particularly debonaire as he leans against the family car, perhaps? And with his second born, my uncle (you can read about him here). And the whole family! My mom is the youngest. My aunt, in the middle, is the oldest child, and my uncle is on the right. And here is where it all began. Without these two I wouldn’t be here today writing this post! Married on October 28, 1944, James and Claire shared just shy of 30 years of marriage together, until my grandfather’s death on Jun 20, 1973. I am not sure where this photo was taken, but it was probably one of the last ones of my grandparents taken together. 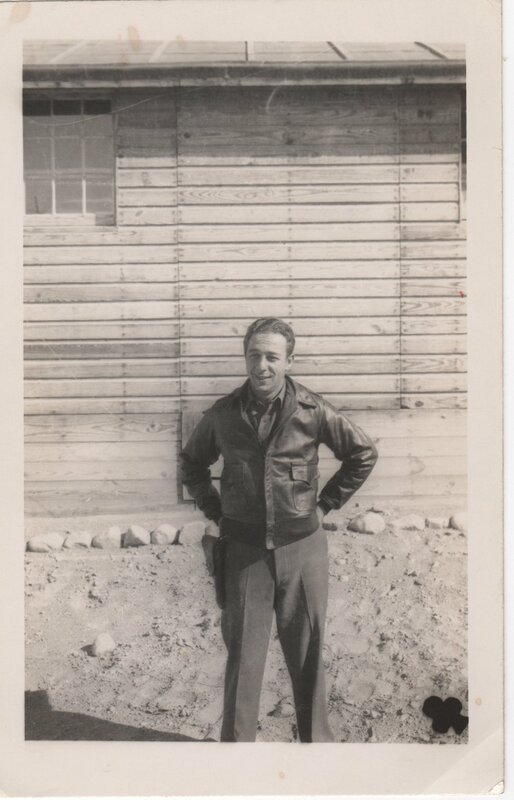 There are hundreds of more photos to look at and stories to hear about my grandfather. I am looking forward to learning more about him. I hope you’ve enjoyed getting to know him just a little bit here through these photographs. Several of my Halvangis family are buried at Evergreen Cemetery in Detroit, MI. Here are some videos I took of my recent trip there. The deep friendship between the Elissavitis and Halvangis families that began in Kokkari in Samos, Greece spanned two countries and many decades. Here is the story of how from friends they became family. The story of my 2nd great uncle, what little I know, from Samos, Greece to Detroit. He travelled on The Themistocles in 1915. Can you help me find the rest of his story? Here's the story of how I found genealogy records of my great grandfather, Vasilios Demetrio Halvangis (1891-1937). Born on the island of Samos, Greece, he came to the U.S. in 1911 on the S.S. Martha Washington. This is the 46th of 52 weekly posts planned for 2018. It was inspired by the #52Ancestors writing challenge issued by professional genealogist, Amy Crow Johnson. The challenge: once a week, for all 52 weeks of the year, write about a relative in your family tree. Newer PostThe Psychogenealogist Pic of the Week (#99) - Is This the Family of Moses Devore (1844-1917)? Older PostThe Psychogenealogist Pic of the Week (#98) - "My time is short"